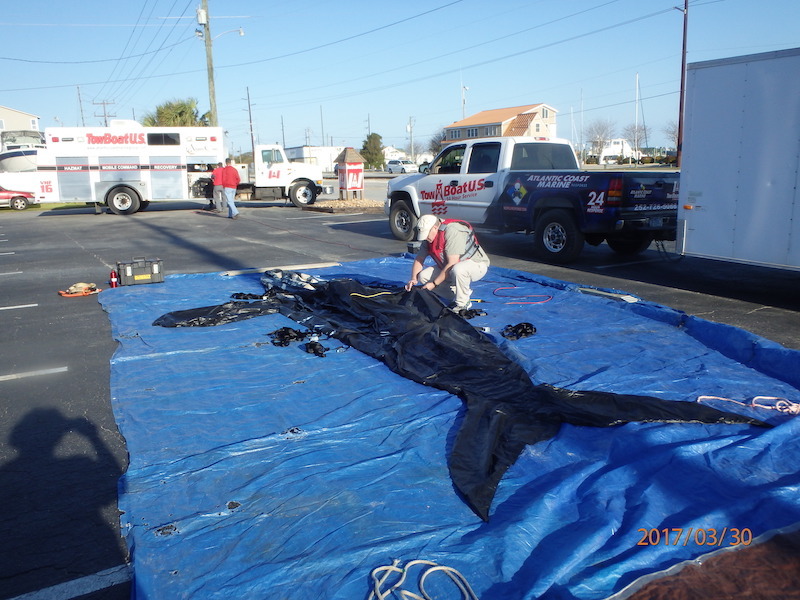 Members of the NC Marine Mammal Stranding Network from NC State CMAST, NC Division of Marine Fisheries, the NC Aquariums, the NC Maritime Museum, and UNC Wilmington, teamed up with marine salvage experts at TowBoatUS in Morehead City, to conduct a live-stranded, healthy whale rescue drill. 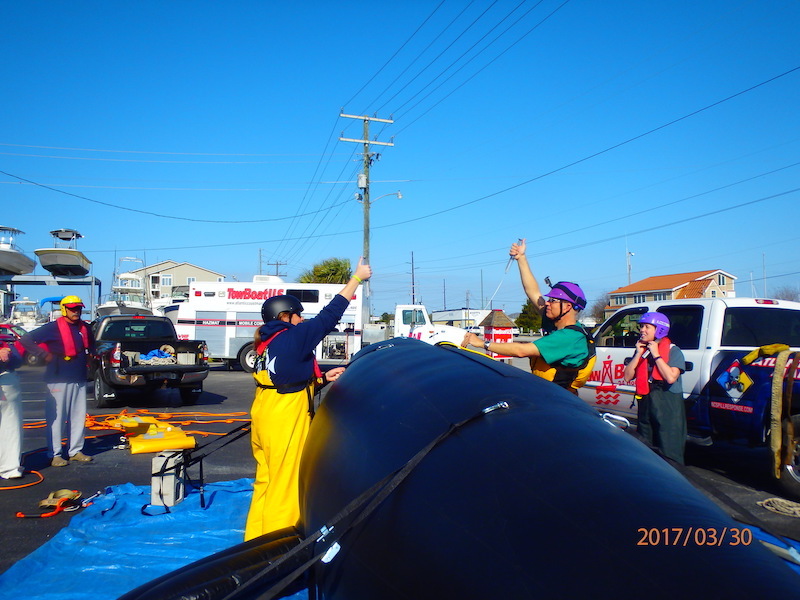 Most single live whale strandings involve animals that are seriously ill or injured, so simply refloating them will not alter the outcome and attempted rescue would put them through unnecessary stress. In those few instances where the whale is otherwise healthy but just unlucky with currents and tides, their best chance of survival is self-rescue at the next one or two high tides. After four or five low tides though, even if a whale started out in good condition, gravitational force on a whale’s massive body without the buoyant support of water can cause cardiorespiratory collapse. 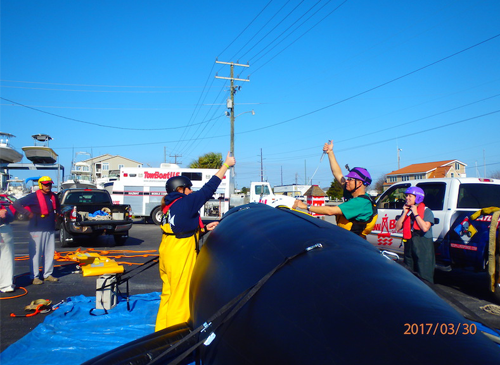 This drill was designed to prepare for that window of opportunity after allowing an otherwise healthy whale to attempt self-rescue during the first one or two high tides, and before too many low tides compromise it irreversibly. 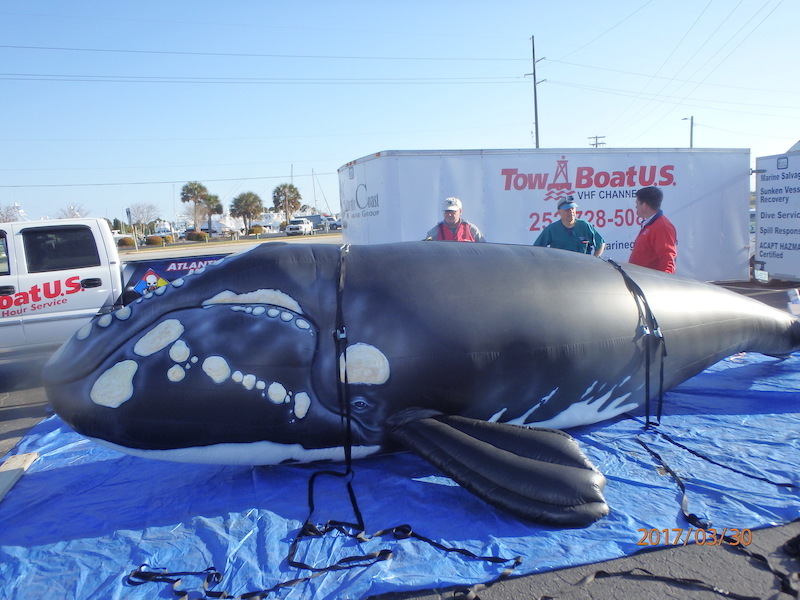 Using a 22’ inflatable right whale (“Calvin”) borrowed from the NC Aquarium, stranding team members (C. Harms, V. Thayer, W. McLellan, E. Christiansen, J. Sullivan, H. Broadhurst, K. Rittmaster, S. Cannizzo) worked with Captain Lee Sykes and his crew in the parking lot of TowBoatUS to simulate a whale rescue, including assessing the whale’s condition and talking through the tide and stranding situation, light sedation to make the whale more relaxed and somewhat safer to work around for the rescue activities, positioning straps and floats to support the whale slightly off the bottom without causing abnormal flexing, towing strategies, and quick-release mechanisms to avoid entanglement. 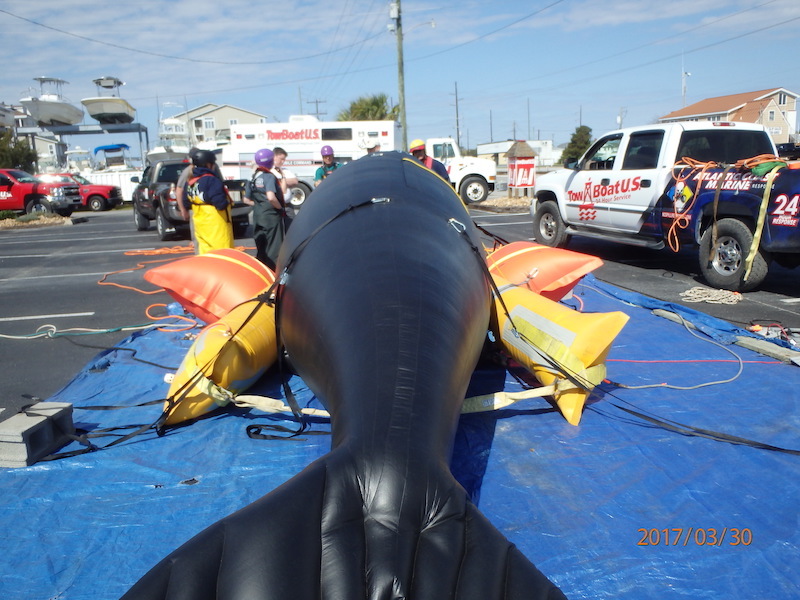 While an inflatable whale in a parking lot cannot replicate an actual live stranded whale on a shoal in challenging weather and currents, this drill was extremely informative to all parties on how varied expertise, experience and equipment could be blended to attempt a rescue if the whale’s condition and stranding situation are favorable. Below is a sequence of photos documenting the process. Note that the straps from the cinder blocks to the top of the whale are to keep it from blowing away. 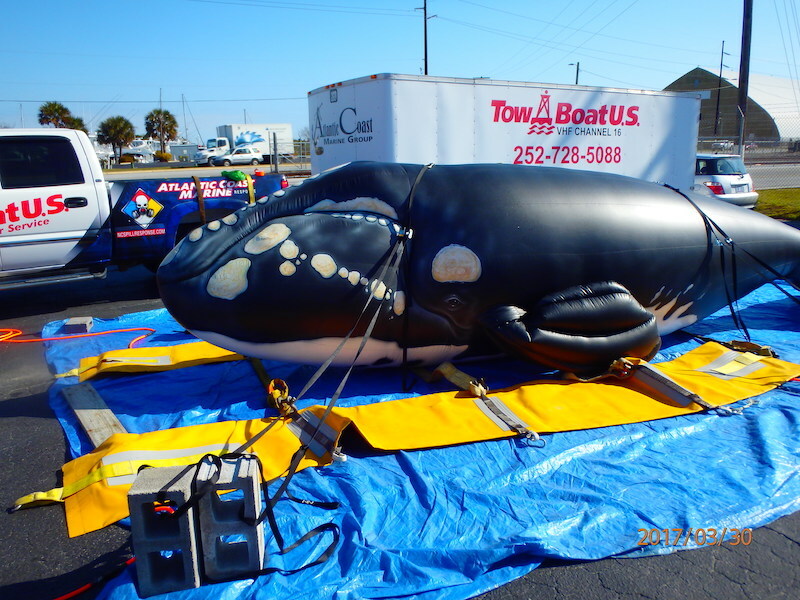 No straps would go over the top of a whale in a real event. 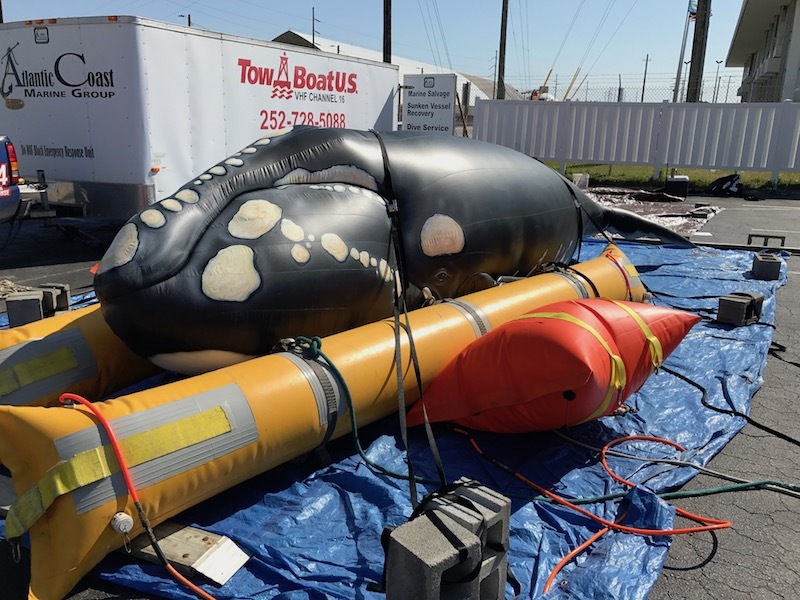 Inflatable right whale “Calvin” pre-inflation. “Calvin” inflated, stranded, and ready for rescue. Float bags arrayed on either side of “Calvin”, linked by straps, and ready for inflation. Rear view of “Calvin” with float bags inflated. “Calvin” with inflated float bags arrayed on either side.